Beloved, I invite you to draw a deep breath and be present with me in a shared, intimate moment between two people. Let us, together, breathe in life as life, while trusting the truth to reveal itself to us. Let us come together not to judge our world or ourselves, but to create a safe space within which we can become more aware of the way our living world communes with us. inside of you? Can you then send that wave of love out to all who now suffer? Allow your love to inform your entire body; and then breathe. Breathe in the boundless aliveness that surrounds you. I invite you to breathe in again, along with me, and then feel into the pain of who are being tortured, enslaved, or murdered in this moment, based solely on where they were born or which faith they embrace. Can you sense their terror and horror inside your own body? Can you take in their suffering fully and then surround it with compassion and boundless love? Allow that love to rise up through your heart and flow out into the world. Encourage the dying to rest in your love as they draw their final breath. And then breathe. Breathe in the silent peacefulness that surrounds you. I further invite you to feel into the fear and struggle of all the living things that now suffer from oppression and abuse or neglect and exploitation. Can you feel their depression, their stress and anxiety? Can you surround and transmute their waves of fear by bathing them with love from within your own heart? Feel compassion arise within you and embody it as fully as you are able. And then breathe your love out into the world as you breathe in the beauty and the wonder of life all around you. How are you feeling right now? Can you redirect your attention inward, to the experience of being alive with compassion? Can you feel the power of the love that dances within your cells, courses through your blood, and pulses into the world around you with every living beat of your precious heart? How relaxed is your mind and how gentle are your thoughts? Do you feel a tingling sensation near the crown of your head? Do you feel more loving, more connected to life, and more at peace—despite all the suffering that exists in our world? Welcome home, Beloved, to the spaciousness that ever abides within you, and where peace can always be found by relaxing within it. For a long time now we humans have forgotten where our true home lies. That wasn’t our fault. We’re not bad, or wrong, or even a sinful people. We’re just a young species, which means we’re still ignorant about how life works. Our current state of self-absorption is a natural phase of our blossoming self- awareness, which is only just now expanding beyond its juvenile phase as it blooms into full adulthood. And as is so for all things childlike, our self-aware consciousness must eventually leave adolescence behind. This maturation process requires consciousness to embrace the weightier responsibilities that come with the greater freedom adulthood provides. The rite of passage involves the powerful realization that if we do not love life we cannot love ourselves—because we are life, and not something separate from it. The quest to realize the truth of ourselves reveals that life, when it is at its best, manifests in the world as a trusting, open, courageous, compassionate, kind, patient, and peacefully loving field of energy. The moment consciousness perceives itself as that, the bud of self-awareness opens as a flowering expression of love. The moment it flowers, consciousness sends out a fragrance that draws to it all others who may wish to co-create. The “self” that self-consciousness so fears losing does not disappear in this transformation any more than a rosebud gets lost when it opens to life. Indeed, the “self” extends and expands in a profusion of living beauty as it unfurls to embrace the aliveness that flows all around it. Self-consciousness transcends its former, youthful limitations through the natural maturation of the quality, creative capacities, and loving intentionality that lie inherent within its evolving self-expression. Beloved, the next phase of humanity will begin once we invite the bud of self-consciousness to flower, so that life-awareness can pollinate our world. In support of this cosmic transformation, nurture your sense of self-consciousness with the energy of love that arises when you fall in love with life—and thus with yourself. Awaken to life’s prime directive and notice what matters. Life wants you to know that it has all the time in the universe to pursue and explore its highest and best of intentions for all of itself. Life is counting on you, as the divinely unique aspect of itself that you presently are, to explore how best to use your body, your mind, your heart, and your spirit so that you can arise and consciously reunite with yourself with life. Relax and allow self-consciousness to unfurl into life-awareness. Observe the world around you and align yourself mindfully with all of life’s paces, flows, rhythms, and energetic thrusts. Life has—miraculously—created you. It now contains and sustains you with unconditional love for who you are—because you are it. Not merely created in life’s image and likeness, but carrying within you the precious seeds of life’s awesome power of love. Therefore, to fall in love with life—and then to place yourself in loving service to life— is to fall in love, at last, with who you are. The seeds of love that you carry within you possess the power to pollinate the entire living cosmos with the power of love. Be love then, and know that you are a perfect expression of life. © 2017 Eileen Workman. Excerpt printed with permission of Muse Harbor Publishing, Raindrops of Love for a Thirsty World, ISBN 978-1-61264-207-9h. 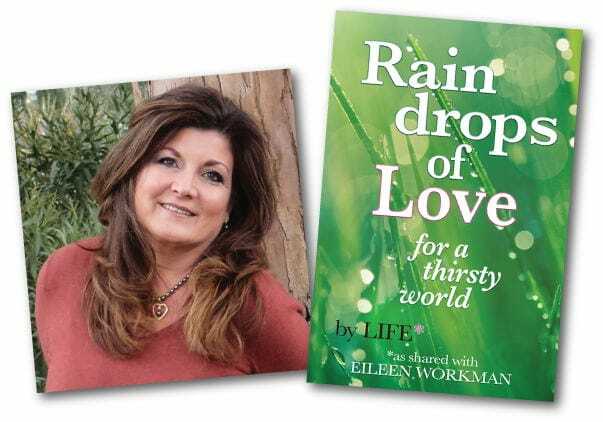 A timely spiritual guide to surviving and thriving in today’s pervasive, gloomy atmosphere of alienation and fear, Raindrops of Love For a Thirsty World lays out a path to life-long self-actualization, and reconnection through a shared consciousness. These communications come at an opportune time, as we drift in a sea of anxiety and worry, deeply shaken by recent political, economic and social crises, and starved for connection due to divisiveness.